As an author and nutritionist, Del Millers, PhD helps women understand what exercise practices are safe for pregnant women and what high risk activities should be avoided to preserve the health of both the mother and baby. 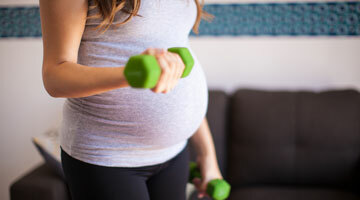 What kind of exercise is safe during pregnancy? That's a question I get a lot, not just from pregnant women but from family and friends and people who are thinking about getting pregnant. And here's the deal, if you've been exercising, keep doing it. If you haven't been exercising, it is also safe to start exercising, because it's good for you and it's good for the baby. And if you've been doing - it's very subjective, because people are at different levels. Someone who has been exercising and they run and they do very challenging workouts - is it okay to do that? The answer is yes. There aren't any kind of studies out there that show those kinds of things negatively affect women. Of course you want to be smart about it. You don't want to do high risk things. So the things that you want to avoid for sure. Well the very basic thing, you want to avoid doing things laying flat on your back after your first trimester. That's very important. It affects the oxygen getting to the fetus. So that's important. Doing a high risk activity with a possibility of falling, like skiing or gymnastics or things like that, doing contact sports. Those kinds of things are not recommended because they're too high risk. But can you run? Yes. My wife jogged right up until probably the day before she gave birth. I have clients who run right up until it's time for labor. So it is safe to exercise and do high level activities while you're pregnant if you're used to that. Now if you're not used to that, then you want to start very slowly and work your way up doing the things that you're doing. And you want to minimize doing high risk things, because it's not what you're used to. That's when it's unsafe.